VATICAN CITY – Pope Benedict XVI blessed a 30-foot-high statue of Mary to celebrate its restoration eight months after a gust of wind knocked it off its perch on a hillside overlooking Rome. In a ceremony June 24 on the Monte Mario hill, Rome’s tallest, the pope praised the city’s residents for their particular devotion to the gigantic statue and noted the “dramatic and providential events” that surrounded its creation and installation in postwar Rome. 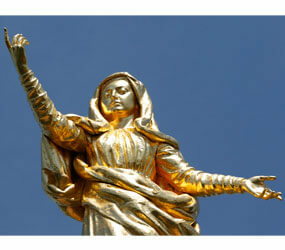 The copper and gold leaf statue, known as the “Madoninna,” was swept off its base during a storm in October 2009 and was broken into three pieces. The pope remembered how Pope Pius XII had prayed to Mary to protect the war-weary population from an imminent battle between German occupiers and allied forces June 4, 1944. Shortly after, word came that the Germans were retreating and that Rome had been spared. The popular Roman priest and saint, Don Luigi Orione, and his followers subsequently arranged for the creation of a work of art to thank Mary for her intercession. The finished statue of Mary with outstretched arms to welcome and protect the people of the Eternal City was installed in 1953. “How could I not renew with you, dear friends of Rome, that gesture of devotion to Mary by blessing this lovely statue?” Pope Benedict said. The pope praised the works of St. Luigi Orione and the order of Orionine Fathers that he founded to perform works of charity, especially for the benefit of orphans and disadvantaged children and young people. Remembering the life and work of Don Orione, as he was known, the pope said that work in the service of others should be carried out through “an authentic and holy spiritual life” in order to be truly charitable. The priest was canonized by Pope John Paul II in 2004, and the order, sometimes known as Little Works of Divine Providence, operates in many parts of the world. Pope Benedict also visited an order of cloistered nuns at the nearby Dominican convent of Santa Maria del Rosario, where he said the daytime prayer of the Liturgy of the Hours. He told the nuns that their contemplative life “places you, as living and vital members, in the heart of the mystic body of the Lord, that is the church” and that their “hidden existence with Christ” served as strong support for the church. The convent houses a 7th-century Greek icon called the Virgin Hagiosoritissa, an image of the Virgin Mary without child that is locally known as Our Lady of St. Luke. The relics of St. Dominic, St. Catherine of Siena and other Dominican saints are also found there.